Thousand Islands might be a classic slot machine, but its theme is a very cool one, being inspired by the first explorers that crossed the oceans, finding America or going around the world in sail ships that gave them very small odds of coming out of this adventure alive. Designed by Microgaming, Thousand Islands has a design that looks almost like an oil painting, using plenty of dark yellows and browns, but doing it in a way that makes it very attractive. A true classic in this regard, the game incorporates 3 reels and 1 bet line. 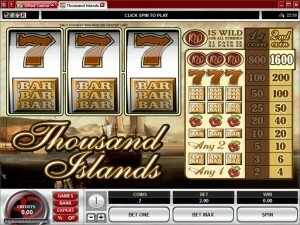 The wild and its multiplier would be the main features, while the jackpot is at $8,000. Despite the classic nature of the game’s layout and symbols, the features are quite good, though often used in such games so they’re not going to surprise you. It’s a wild symbol, with multipliers attached. This wild uses the image of a logo with the number 1,000 on it. Like it pretty much always happens, the wild symbol is also the one responsible for giving away the big prize, which is worth 1,600 coins. In most cases you’re going to see it used as a wild though, appearing once or twice on the payline and contributing to a new combo being formed. It substitutes for other symbols, plus it applies multipliers to the wins awarded with its help. You get a 2x multiplier when a single wild is part of a combo, so the win is worth double the amount mentioned on the paytable. When two wilds are on that line, together with a third regular symbol, the newly formed combo has a 4x multiplier applied to its win. 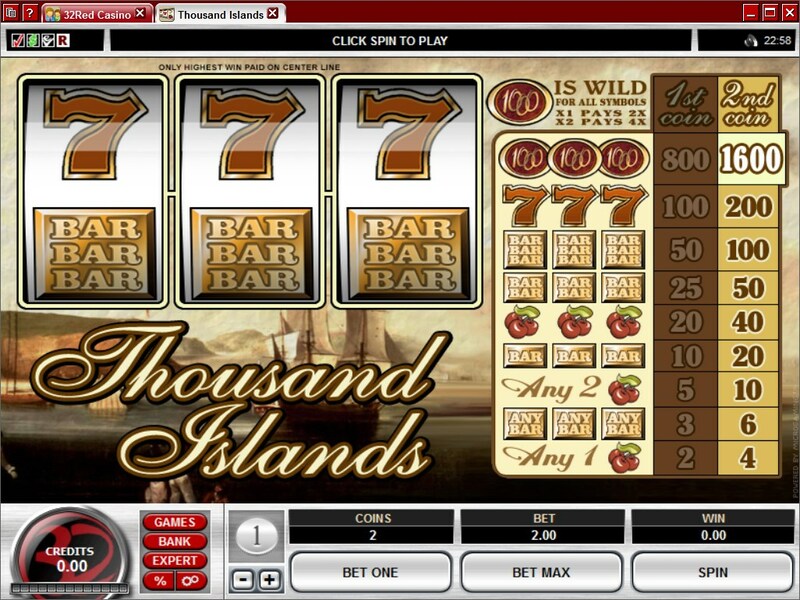 You get the usual option, to use 1 or 2 coins on that one payline of Thousand Islands. The denomination is left up to you as well, within the range of $0.25 to $5. When both coins are used, at the max denomination, you end up with bets of up to $10. A 2 coin wager can bring you a reward of up to 1,600 coins, while their value can’t go higher than $8,000. The features might be good, but they’re not new or extraordinary in any way. The design is the truly attractive part about this game, and the one that will make players try it out if they love adventure. Paying tribute to the European explorers that used sail ships to cross oceans, Thousand Islands has a beautiful background image with a port, where a couple of ships are preparing to depart. The same vintage feel that you get from the background is visible in the symbols and the paytable as well. Symbols: 1,000 Logo (1,600 coins, wild), Seven (200 coins), Three Bar (100 coins), Two Bar (50 coins), Cherries (40 coins) and One Bar (20 coins). It’s the theme and design that make all the difference here, as the features and the layout are identical to the ones found in dozens of classic slots. This Thousand Islands slot is offered by all online casinos with Microgaming software, playable either in practice or in real money mode.